E.G.R. valve located at the right rear of the intake manifold. The second port in the throttle body is located midway between the top of each valve and the throttle body casting and is positioned higher to act as an air bleed for the lower port, thereby modulating the amount of vacuum signal supplied by it. closed during curb idle operation. The idle air by-pass system helps prevent gum and carbon formation, that may form around the valves, from disrupting engine idle. In this system, idle air is taken from the carburetor bore above the throttle valves, by-passes around the closed throttle valves through a separate air channel, and enters the carburetor bore just below the throttle valves. The amount of air which is supplied to the engine is regulated by an idle air adjustment screw located in the idle air by-pass channel. The idle air adjustment screw is mounted in the float bowl casting at the rear of the carburetor unit. Turning the screw inward (clockwise) decreases the engine idle speed and turning it outward (counterclockwise) increases the engine speed. As the throttle valve is opened further in the part throttle range, the upper port ceases to function as an air bleed and is gradually exposed to manifold vacuum to supplement the signal at the lower port. In this way, the E.G.R. valve operation is timed for precise metering of exhaust gases to the intake manifold, so that just the right amount of exhaust gases can be added to the inlet mixtures to lower peak combustion temperatures for proper control of oxides of Nitrogen (NOx) emissions. To obtain sufficient idle air for stable idle speed adjustment, a fixed idle air bleed is necessary. 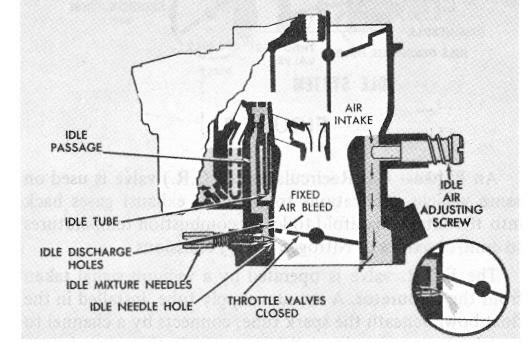 The fixed idle air bleed in the 2-bore carburetor is accomplished by a drilled hole through each throttle valve. The fixed idle air bleeds maintain a constant idle air flow for part of the idle air requirements, while the idle air adjustment screw regulates the remainder of the idle air. Thus, the engine speed can be adjusted by the idle air adjusting screw. Some applications use a timed vertical port (See inset 2, Figure 7) in the throttle body bore to provide a vacuum signal to the E.G.R. valve in the off-idle and part throttle ranges of the carburetor. The Exhaust Gas Recirculation system does not operate during engine idle. Another feature added to some exhaust emission control carburetors is an adjustable off-idle (A.O.L), air bleed system. A separate air channel is added in the float bowl beneath the venturi cluster. An adjustment screw is located at the end of the channel to control the amount of air bleeding into the idle system. The off-idle air bleed screw is adjusted at the factory to maintain very accurate off-idle air/fuel mixture ratios. It is adjusted during carburetor flow test, then capped, and no attempt should be made to readjust in the field. During prolonged idling in heavy traffic in hot weather, under-hood temperatures can exceed 200 degrees Farenheit causing severe percolation or boiling of fuel in the carburetor float bowl. With excessive heat, all fuel vapors cannot be eliminated through normal venting and some will be drawn into the carburetor bore and intake manifold resulting in over-rich idle mixtures. The rich mixture causes a rough idle and may even cause engine stalling. The Hot Idle Compensator is used on some 2G carburetor models to off-set the enriching effects caused by these excessive fuel vapors by supplying additional air to the intake manifold when idle air/fuel mixtures become rich due to temperature increase. The compensator consists of a thermostatically-controlled valve usually mounted in the area above the main venturi or at the rear of the float bowl. 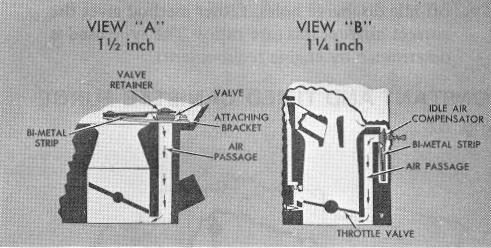 The valve closes off an air channel which leads from above the carburetor venturi to a point below the throttle valves.